Create your email signature on NEWOLDSTAMP and follow these simple steps to install it in iPhone/iPad. Select the Apple icon in the list of email clients. Scroll down the Signature Preview and Click the “Send Email” button, which will save the signature code in the clipboard. Specify your email address in the Step 1 and click “Send”. 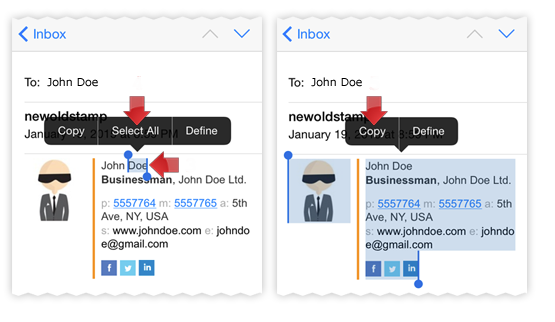 Open the email on your iPhone/iPad with a Mail App, tap and hold any part of the signature, click “Select All” and then Copy. 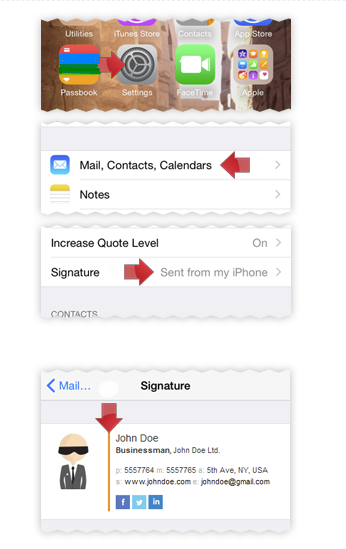 Go to iPhone/iPad Settings -> Mail, Contacts, Calendars -> Signature. Tap and hold the signature box and Paste your signature. Shake the iPhone/iPad right after pasting the signature, select “Undo” and Save Changes. Close the signature settings window regardless of how the signature looks like on the preview as sometimes it may look disrupted. Congratulations! 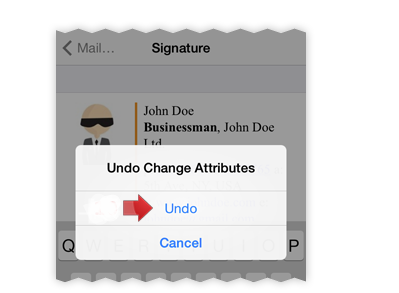 Now you will see you new signature in every email you send with iPhone/iPad.